Pregabalin (PG) is an anticonvulsant, analgesic and anxiolytic drug. A survey of the literature reveals that all the reported spectrophotometric methods are either don't offer high sensitivity, need tedious extraction procedures, recommend the measurement of absorbance in the near UV region where interference most probably occurs and/or use non specific reagent that don't offer suitable linearity range. Two new sensitive and simple spectrophotometric methods were developed for determination of pregabalin (PG) in capsules. Method (I) is based on the reaction of PG with 1,2-naphthoquinone-4-sulphonate sodium (NQS), yielding an orange colored product that was measured at 473 nm. Method (II) is based on the reaction of the drug with 2,4-dinitrofluorobenzene (DNFB) producing a yellow product measured at 373 nm. The different experimental parameters affecting the development and stability of the reaction product in methods (I) and (II) were carefully studied and optimized. The absorbance-concentration plots were rectilinear over the concentration ranges of 2-25 and 0.5-8 μg mL-1 for methods (I) and (II) respectively. The lower detection limits (LOD) were 0.15 and 0.13 μg mL-1 and the lower quantitation limits (LOQ) were 0.46 and 0.4 μg mL-1 for methods (I) and (II) respectively. The developed methods were successfully applied to the analysis of the drug in its commercial capsules. The mean percentage recoveries of PG in its capsule were 99.11 ± 0.98 and 100.11 ± 1.2 (n = 3). Statistical analysis of the results revealed good agreement with those given by the comparison method. Proposals of the reaction pathways were postulated. Pregabalin (PG) Figure 1, (S)-3-(amino methyl)-5-methylhexanoic acid is lipophilic GABA (γ-aminobutyric acid) analog but it is inactive at GABAA and GABAB receptors . The main site of action of PG appears to be on the α2δ subunit of presynaptic, voltage-dependent calcium channels that are widely distributed throughout the peripheral and central nervous system. Pregabalin binds potently to the α2δ subunit and modulates calcium influx at nerve terminals, and, thereby, reduces the release of several neurotransmitters, including glutamate, nor- adrenaline, substance P, serotonin and dopamine. These activities and effects result in the anticonvulsant, analgesic and anxiolytic activity exhibited by PG. Recently, pregabalin has been approved by the FDA for the treatment of spinal cord injury and as the first drug indicated for the treatment of fibromyalgia . Structural formula of Pregabalin (PG). Pregabalin is not yet the subject of monograph in any pharmacopeia. The literature survey revealed that few analytical methods have been published concerning the analysis of pregabalin in its dosage forms and biological matrices viz, spectrophotometric [3–8], specrtofluorimetric [3, 9–11] and chromatographic [12, 12–26] methods. The chromatographic methods require high cost solvents in addition to elaborate treatment. On the other hand, Specrtofluorimeters are not available in many labs. Regarding spectrophotometric methods for determination of PG, some of them don't offer high sensitivity [5, 7, 8] or need tedious extraction procedures . Meanwhile, some of the spectrophotometric methods recommended the measurement of absorbance in the near UV region where interference most probably occurs [4, 7] or use non specific reagent (Potassium iodide/potassium iodate) that don't offer suitable linearity range . Therefore, our target was to develop rapid, simple, efficient and selective methods for the analysis of PG in pharmaceutical formulations. The proposed methods are based on the reaction of PG through its primary amino group either with 1,2-naphthoquinone-4-sulphonate(NQS) at pH 10.5 or 2,4-dinitrofluorobenzene(DNFB) at pH 9.0 to form colored reaction products peaking at 473 and 373 nm for the two methods, respectively. The main advantages of the proposed methods are being simple, rapid and not require tedious extraction procedure. Compared to other reported spectrophotometric methods, the proposed methods are either more sensitive or even having comparable sensitivity. All the reagents used were of Analytical grade and distilled water is used throughout the work. Pregabalin pure sample was kindly provided by Pfizer company (Sandwich, UK) with a purity of 100.18% as determined by the comparison method. Lyrica® capsules batch # 0744019 (labeled to contain 75 mg PG each), ,product of Pfizer company, were obtained from commercial sources in the local Pharmacy. The 1,2-Naphthoquinone-4-sulphonate sodium (Fluka chemica, USA) solution was freshly prepared as 0.5% (w/v) aqueous solution, for method I. The 2,4-Dinitrofluorobenzene (Fluka chemica, USA) solution was freshly prepared as 0.3% (v/v) in methanol, for method II. Methanol, Hydrochloric acid, Borax and Boric acid (BDH, UK). Borate buffer solutions (0.2 M) were prepared by mixing appropriate volumes of 0. 2 M boric acid with 0.2 M borax and adjusting the pH to 10.5 and 9.0 using pH Meter. Stock solution of PG was prepared by dissolving 10.0 mg of the drug in 100 mL of distilled water. This solution was further diluted with the same solvent as appropriate to obtain the working concentration range. The stock solution is stable for 7 days when kept in the refrigerator. To a set of 10 mL volumetric flasks, appropriate aliquots of the standard working solution were transferred, to obtain concentrations in the range (2-25 μg mL-1). To each flask 1 ± 0.5 mL of borate buffer solution (pH 10.5) followed by 1.0 mL of NQS solution (0.5%) were added and mixed well. The solutions were heated in thermostatically controlled water bath at 55 ± 5°C for 10 min. The reaction was stopped by cooling under tap water, and solution was completed to the volume with distilled water. The absorbance of the resulting solution was measured at 473 nm against a reagent blank prepared simultaneously. The calibration graph was constructed by plotting the absorbance versus the final concentration of the drug. Alternatively, the corresponding regression equation was derived. To a set of 10 mL volumetric flasks, appropriate aliquots of the standard working solution were transferred, to obtain concentrations in the range (0.5-8 μg mL-1). To each flask 1.5 ± 0.5 mL of borate buffer solution (pH 9 ± 0.5) followed by 0.6 ± 0.2 mL of DNFB solution (0.3% v/v) were added and mixed well. The solutions were heated in thermostatically controlled water bath at 70 ± 10°C for 20 min. The reaction was stopped by cooling under tap water, and then 0.2 mL of HCl was added and the solutions were made up to volume with distilled water. The absorbance was measured at 373 nm against a reagent blank. The absorbance was plotted versus the final concentration of the drug to obtain the calibration graph. Alternatively, the corresponding regression equation was derived. The contents of the ten Lyrica® capsules were emptied, weighed and then mixed well. A weighed quantity of the powder equivalent to 40.0 mg PG was transferred into 100 mL conical flask, extracted with 3 X 30 mL of distilled water and filtered if needed into 100 mL volumetric flask and the solution was completed to 100 mL with distilled water to prepare a stock solution of 400 μg mL-1. This solution was further diluted with the same solvent as appropriate to obtain the working concentration range. Aliquots covering the working concentration ranges (8, 15 and 20 μg mL-1 for Method I and 3,4 and 6 μg mL-1 for Method II) were transferred into a series of 10 mL volumetric flasks and the procedures under the two methods were applied. The nominal content of the capsules was determined using the corresponding regression equations or the calibration graphs. Pregabalin has no specific absorbance since it is aliphatic compounds and devoids of any chromophores or auxchromes which are essential for light absorption. However, a spectrophotometric method was reported for the determination of PG based on the direct measurement of the absorbance at λmax 210 nm (4). In contrast, other repots (7, 10) confirmed that, the drug has no specific absorbance in the UV-region. This renders its spectrophotometric determination a challenging problem. Such problem is highly aggravated when it is necessary to determine the drug especially in pharmaceutical preparations. 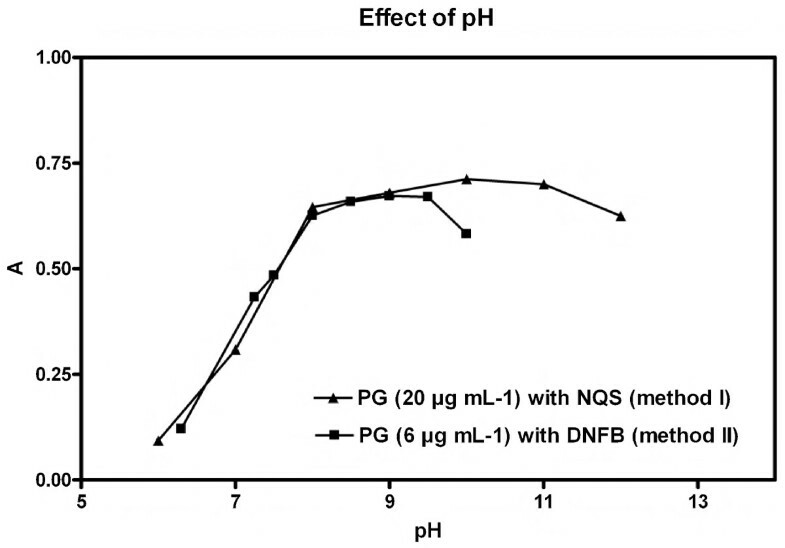 However, aliphatic nature of PG and presence of a primary amino group which is susceptible to derivitazation with nucleophilic reagents such as NQS or DNFB initiated the present study. 1,2-naphthoquinone-4sulphonate sodium has been used as chromogenic and fluorogenic reagent for the analysis of many pharmaceutical primary and secondary amines [27–29]. However, its reaction with PG has not been yet investigated. Therefore, the present study was devoted to explore NQS as a derivatizing reagent for the development of spectrophotometric method for the determination of PG in its capsules. NQS was found to react with PG in borate buffer of pH 10.5 yielding a highly colored orange reaction product which exhibit maximum absorbance at 473 nm (Figure 2). 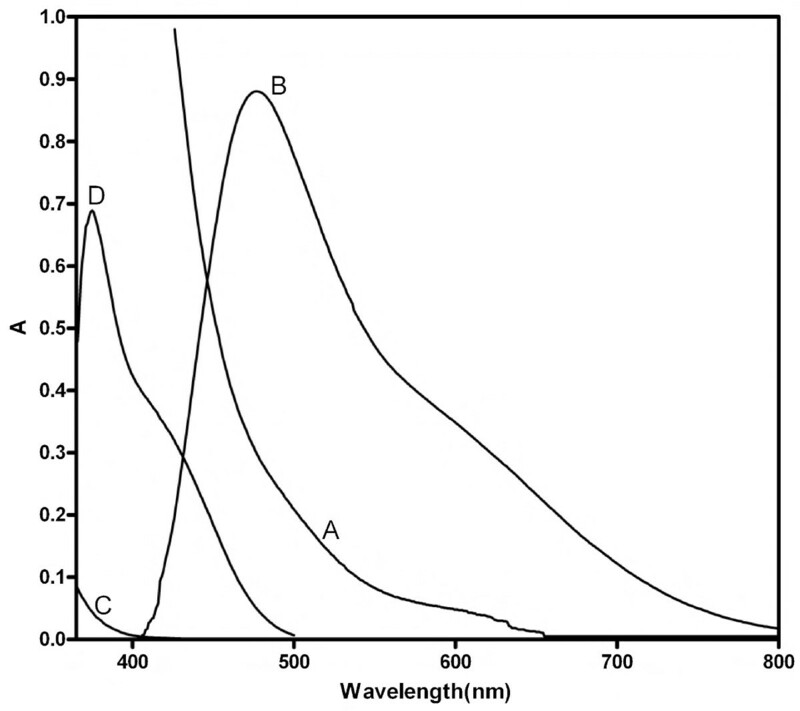 Absorption spectra of (a) NQS 0.5%(w/v) in water (method I). (b) PG (25 μg mL-1) with NQS (method I). (c) DNFB 0.3%(w/v) in methanol (method II). (d) PG (6 μg mL-1) with DNFB (method II). The analytical applications of 2,4-dinitrofluorobenzene (DNFB) for the assay and characterization of specific functional groups such as primary and secondary amines, phenols, thiols and imidazoles have been reported by Connor [30, 31]. In the present work DNFB reacts through a nucleophilic aromatic substitution reaction with the primary aliphatic amino group of PG in aqueous alkaline medium. 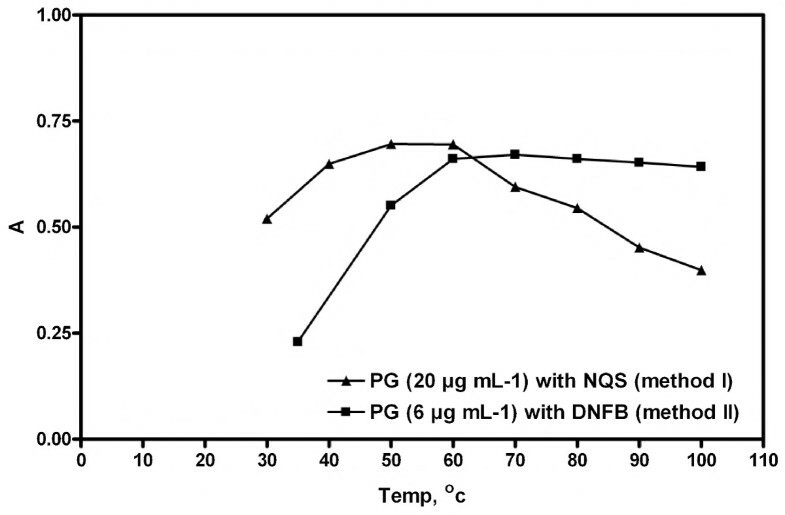 The reaction between PG and DNFB is very slow at room temperature and required heating to accelerate it. A yellow colored reaction product peaking at 373 nm is produced (Figure 2). The experimental conditions were established by varying each in turn while keeping all others constant. These variables include; effect of pH and volume of buffer, effect of the concentration of reagents, effect of heating temperature and heating times, effect of diluting solvent and effect of time on stability of the reactions products. The influence of pH on the formation of the reactions products was studied over the range of 6.0-12.0 using 0.2 M borate buffer solution. Maximum and constant absorption intensities were achieved at pH 10.5 ± 0.5 for Method I and 9.0 ± 0.5 for Method II. Therefore, pH 10.5 and 9.0 were chosen as the optimum pH values for Methods I and II, respectively (Figure 3). Effect of the pH of 0.2 M borate buffer on the absorbance of the reaction product of PG of PG with NQS or DNFB. Maximum absorbance intensities were achieved using 0.8-1.5 mL or 1.0-2.0 mL of borate buffer solutions for Methods I and II, respectively (Figure 4). So that, 1.0 mL of borate buffer solution of pH 10.5 and 1.5 mL of borate buffer solution of pH 9.0 were chosen as the optimum buffer volumes for Methods I and II, respectively. 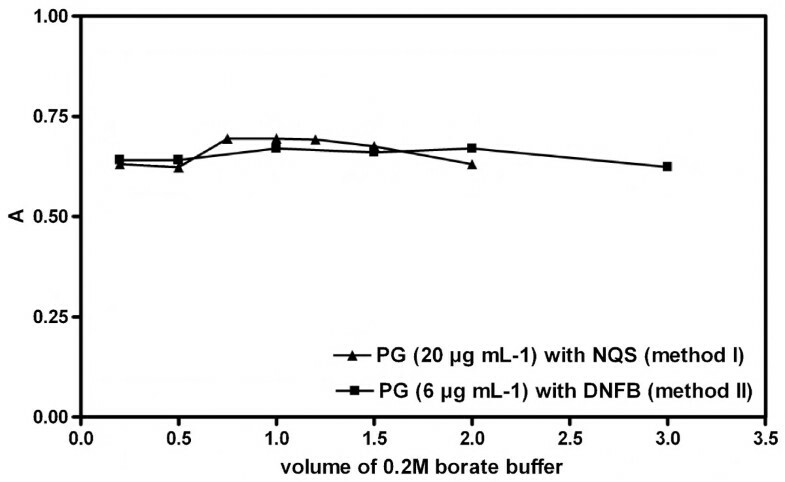 Effect of the volume of 0.2 M borate buffer on the absorbance of the reaction product of PG with NQS or DNFB. 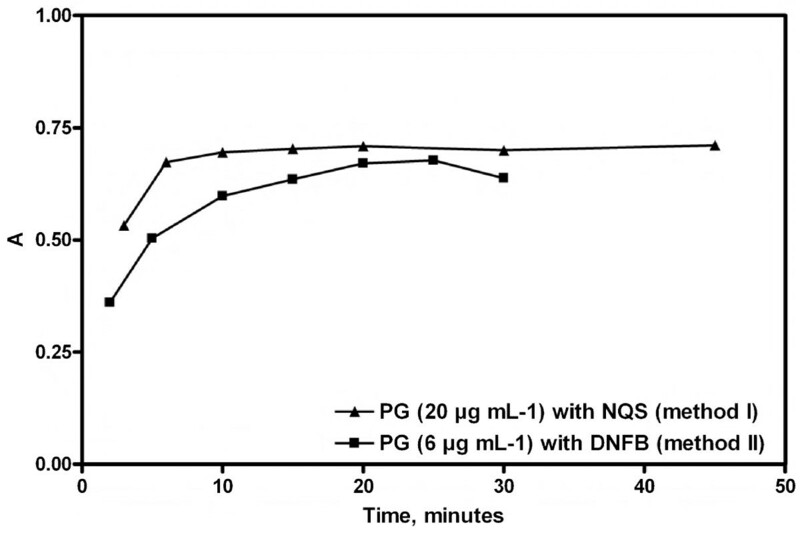 The influence of the reagents concentration was studied using different volumes of either 0.5% w/v solution of NQS (Method I) or 0.3% v/v solution of DNFB (Method II). It was found that, increasing volumes of the reagents produced a proportional increase in the absorbance values. 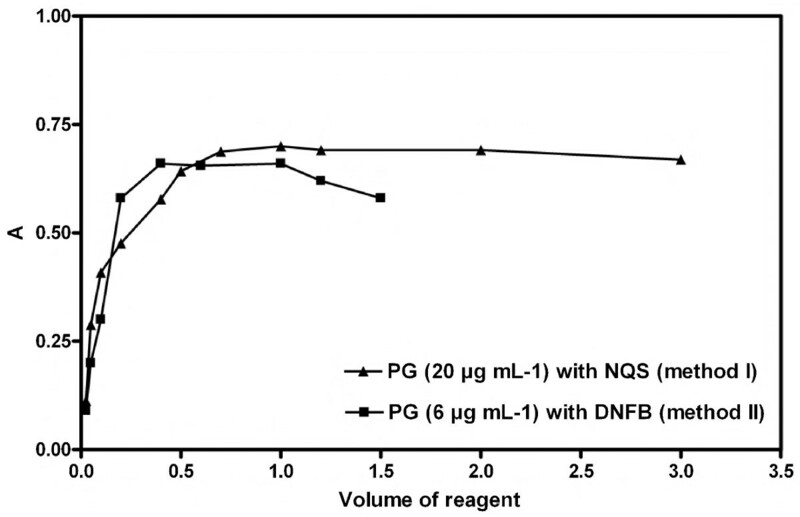 Maximum absorbencies were achieved using volumes of the reagents ranged from 0.7-2.0 or 0.4-1.0 mL of NQS or DNFB for Methods I and II, respectively. Further increase of the reagents volume produced a gradual decrease in the absorption intensity. 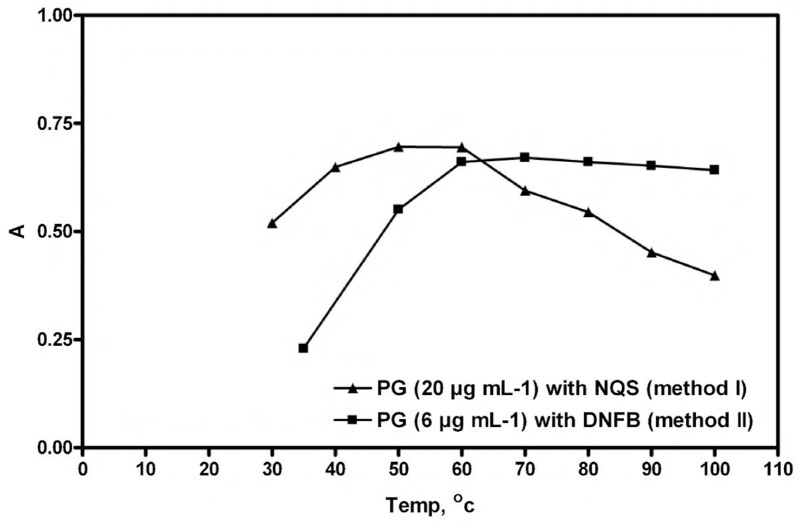 Therefore, 1 mL of 0.5% w/v NQS solution and 0.6 mL of 0.3% v/v DNFB solution were chosen as the optimal volumes of the reagents for Methods I and II, respectively (Figure 5). For Method II, to remove the excess DNFB reagent interference in the absorbance measurement of the reaction product, this excess was acid-hydrolyzed to colorless 2,4-dinitrophenol by adding 0.2 mL of HCl allowing the measurement of PG-DNFB derivative which remains stable. Effect of the volume of reagent on the absorbance of the reactions products of PG with NQS or DNFB. The effect of the heating temperatures on the formation of the reactions products was studied using a thermostatically controlled water bath at different temperature settings ranging from (30-100 °C). For both methods, the results revealed that increasing the temperature resulted in an increase in the absorbance values of the reactions products. The maximum absorbance values were attained at 50-60 and 60-80 ° C for Methods I and II, respectively. At higher temperatures, the absorbance of the reaction product decreased gradually in case of Method I, on the other hand slight decrease of the absorbance occurred in case of Method II (Figure 6). The decrease in the absorbance was probably attributed to the instability of the PG derivatives at higher temperatures. Therefore, the studies were carried out at 55 and 70°C for Methods I and II, respectively. Effect of the temperature on the on the absorbance of the reactions products of PG with NQS or DNFB. The effect of heating times on the formation of the reactions products were investigated at different time intervals. The results revealed that, for Method I, complete reaction was achieved within 10 min and further increase in the reaction time did not affect the absorbance intensity (Figure 7). Regarding Method II, the reaction went to completion within 20 min, and longer reaction times up to 25 min did not affect the absorbance intensity. On the other hand, heating for 30 min resulted in slight decrease in absorbance intensity. So that, 20 min was selected as the optimum reaction time for Method II (Figure 7). Effect of the heating time on the on the absorbance of the reactions products of PG with NQS or DNFB. The effect of diluting solvents on the absorbance intensities of the reactions products was tested using different solvents viz water, methanol, acetone, acetonitrile and dimethylformamide. Using water as diluting solvent gave the highest absorbance values and best peaks shapes. Water was chosen finally as the best diluting solvent for the two methods. Regarding the stability of the produced derivatives, both were found to be stable at room temperature for approximately 2 hour. The validity of the proposed methods was tested regarding linearity, specificity, accuracy, repeatability and intermediate precision according to ICH Q2(R1) recommendations . The calibration graphs obtained by plotting the values of the absorbance versus the final concentration of the drug (μg mL-1) were found to be rectilinear over the concentration ranges cited in Table 1. The proposed methods were evaluated for the accuracy as percent relative error (% Er) and the precision as percent relative standard deviation (% RSD) (Tables 1 and 2). Each result is the average of three seperete determinations. a_Values between brackets are the tabulated t and F values, at p = 0.05 . Table 1. The small values of the figures indicate low scattering of the points around the calibration line and high precision. The limits of quantitation (LOQ) were determined by establishing the lowest concentration that can be measured according to ICH Q2(R1) recommendation  below which the calibration graph is non linear. The results are shown in Table 1. The limits of detection (LOD) were determined by evaluating the lowest concentration of the analyte that can be readily detected. The results are also summarized in Table 1. To test the validity of the proposed methods they were applied to the determination of pure sample of PG over the concentration ranges cited in Table 1. The results obtained were in good agreement with those obtained using the comparison method. Statistical analysis of the result obtained using student t-test and the variance ratio F-test  revealed no significance differences between the proposed and comparison methods regarding the accuracy and precision, respectively (Table 2). The spectrophotometric comparison method  is based on the derivitization of PG with7-chloro-4-nitrobenzofurazon (NBD-Cl) . The absorbance of the reaction product was measured at 460 nm and the concentration was rectilinear over the concentration range 0.5-7.0 μg mL-1. The repeatability was performed over the specific concentration range through replicate analysis of three concentrations of PG in pure form on three successive occasions. The results are presented in Table 3. Intermediate precision was tested by repeated analysis of PG in pure form using the concentrations shown in Table 3 for a period of 3 successive days. The results are summarized in Table 3. High % recovery, low SD and low % RSD indicate high accuracy and precision of the proposed method respectively (Table 4). a Values between brackets are the tabulated t and F values, at p = 0.05 . The robustness of the procedures adopted in the two proposed method was demonstrated by the constancy of the absorbance intensity with the deliberated minor changes in the experimental parameters. For Method I, the changes included the pH of borate buffer solution, 10.5 ± 0.5, the change in the volume of the buffer solution, 1.0 ± 0.5 mL, the change in the volume of NQS (0.5% w/v), 1.0 ± 0.3, the change in the heating temperature, 55 ± 5°C and the change in the heating time, 10 ± 2 min. Meanwhile, for method II these changes included the pH of borate buffer solution, 9.0 ± 0.5, the change in the volume of the buffer solution, 1.5 ± 0.5 mL, the change in the volume of DNFB (0.3% v/v), 0.6 ± 0.2 mL, the change in the heating temperature, 70 ± 10 °C and the change in the heating time, 20 ± 2 min. These minor changes that may take place during the experimental operation didn't affect the absorbance of the reactions products. The Selectivity of the methods was investigated by observing any interference encountered from the common capsule excipients, such as lactose monohydrate, corn starch and talc. These excipients did not interfere with the proposed methods. The proposed methods were successfully applied to the determination of the studied drug in its pharmaceutical preparations. The results obtained were statistically compared to those of the comparison method  using Student's t-test for accuracy and the variance ratio F-test for precision respectively (Table 4). The results obtained indicate no significance difference between the proposed methods and the comparison one. The stoichiometry of the reactions in the two methods was studied adopting the limiting logarithmic method . 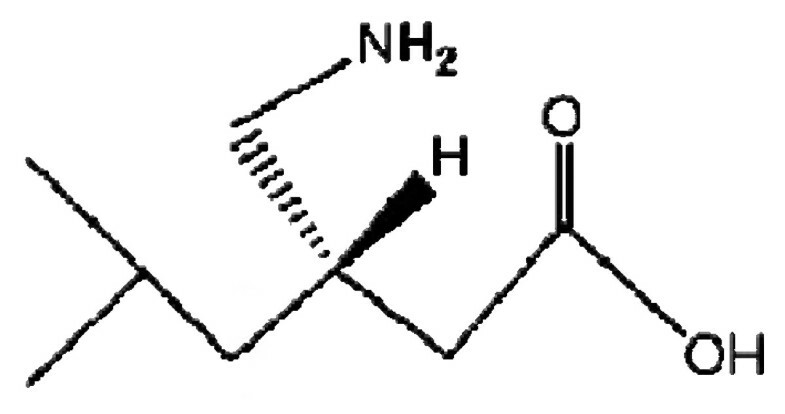 The two straight lines were obtained using increasing concentrations of the reagent while keeping the concentration of the drug constant and using increasing concentrations of the drug while keeping the concentration of the reagent constant. 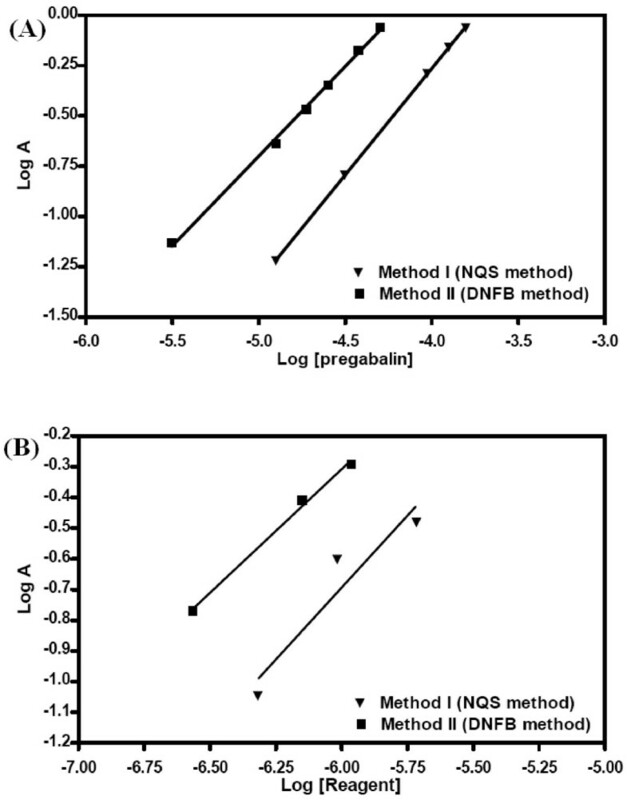 Plots of log absorbance versus log [NQS] and log [PG] gave two straight lines, the slopes of which were 0.93 and 1.05 for NQS and PG, respectively (Figure 8). Hence, It is concluded that the reaction proceeds in the ratio of 1:1, confirming that one molecule of the drug condenses with one molecule of NQS. Limiting logarithmic plots for the molar reactivity of PG with the two proposed reagents. (A) log A vs log [reagent] with [PG] kept constant; (B) log A vs log [PG] with [reagent] kept constant. For Method II the determination of the stoichiometry of the reaction of PG and DNFB was performed similarly. Plots of log absorbance versus log[DNFB] and log[PG] gave straight lines, the values of their slopes were 0.77 for DNFB and 0.89 for PG (Figure 8). Hence, it is concluded that the reaction proceeds in the ratio of 1:1, confirming that one molecule of the drug condenses with one molecule of DNFB. Based on the obtained molar ratios and in analogy to previous studies (19, 23) reactions pathways are postulated to proceed as shown in schemes 1 and 2, respectively. Proposed reaction pathway between NQS and PG under the described reaction conditions. Proposed reaction pathway between DNFB and PG under the described reaction conditions. The proposed spectrophotometric methods provided sensitive, specific and inexpensive analytical procedures for determination of the non-chromophoric drug PG either per se or in its capsule dosage forms without interference from common excipients. Moreover, the developed methods are less time-consuming and do not require elaborate treatments associated with chromatographic methods. Moreover, the reagents used are nonirritant in contrast for NBD-Cl which cause high irritant effect to the skin these attributes, in addition to the satisfactory sensitivity and reproducibility as well as the convenience and simplicity, make the two proposed methods suitable for routine analysis in quality control laboratories.